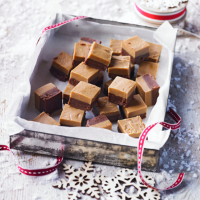 Why not try making this lovely chocolate toffee fudge. It makes a great gift and the kids can help you make it too! 1. Lightly oil a 22 x 28cm cake tin. For the chocolate fudge, place the cream, caster sugar, liquid glucose, butter and chocolate in a large saucepan. Heat gently, stirring until the sugar dissolves then bring to the boil and bubble for 5–10 minutes, stirring regularly until it reaches 120°C on a sugar thermometer. Carefully pour into a large heatproof bowl. Leave to cool for a few minutes. 2. Meanwhile, for the toffee fudge, place the cream, muscovado sugar, liquid glucose, butter and vanilla in a separate pan. Heat gently, stirring until the sugar dissolves then bring to the boil and bubble for 5–10 minutes, stirring regularly until it reaches 120°C on a sugar thermometer. Carefully pour into a large heatproof bowl. Leave to cool for a few minutes. 3. Using an electric whisk, beat the chocolate mixture for 5 minutes or until it thickens. Pour into the tin. 4. Rinse and dry the beaters then whisk the toffee mixture for 5 minutes until it thickens. 5. Pour the toffee fudge on top of the chocolate fudge. Leave to cool then cover with clingfilm and set in the fridge overnight. Cut into small squares and store in an airtight container.